It’s 1387 and 15-year-old Belle lives with her crippled father in London. He’s a bell founder—a maker of large church bells—and she’s an impractical dreamer, unable to focus on anything for very long. In fact, it is her carelessness, she believes, that led to her father’s injury. Belle meets a studious young man at the Tabard, the inn next door to her home. Luke is the son of an alchemist, and scribe to the famous poet Master Chaucer. Luke and Master Chaucer are on a pilgrimage headed to Canterbury to pray to the relics of Saint Thomas Becket. Chaucer wants to intercede on behalf of his sick wife, while Luke promised God that he would become a monk if the Master chose him as scribe. Belle joins the pilgrims, determined to pray for a miracle that will let her father walk once more. But she has no money, no horse, no fancy clothing for the trip; however, Belle immediately befriends two other pilgrims, a knight and his son, Squire Walter. They loan her a horse and offer to pay for her food and lodging along the way. The pilgrims are a divergent lot, raucous and rowdy, seemingly borrowed straight from Chaucer’s Canterbury Tales. They share many of the less attractive attributes of modern society, engaging in avarice and lechery, blackmail and intimidation, political intrigue and treacherous conspiracy. Belle herself is obsessive-compulsive and self-injures, pumicing her legs into bloody shreds when anxiety and guilt overwhelm her. As Belle struggles with her damaging behaviors, she discovers that she’s drawn to both Luke and Walter. It appears that her affections will be unrequited. Both men are fond of her, but Luke is off to an abbey after the pilgrimage and unwilling to engage in flirtations, while Walter, well, Walter loves Luke (a fact that could cost Walter his freedom if not his life, if his feelings come to light). It’s not long before slimy Summoner Seekum, the man who summons sinners before religious authorities, threatens to harm Belle’s father unless she helps him. He needs a well-placed spy. Belle must report to the Summoner what Master Chaucer says and does, and what his scribe Luke is writing. For the Summoner suspects Master Chaucer is scheming against King Richard II. And indeed, he is plotting. Master Chaucer chose Luke for this journey because of Luke’s unusually good memory. After finishing devotions at Canterbury, Luke must take King Richard’s signet ring to King Charles of France along with a secret message he holds in his head. King Richard, having ascended to the throne at the tender age of ten, is not an effective leader, and his support among the people wanes. Chaucer believes the French king can help bolster the young king’s power. English royal history is complex and Chaucer’s role in it unclear to historians. Ms. Grant peppers her story with just enough mystery and conspiracy to make her story an engaging and realistic representation of the period while maintaining lucidity. Circumstances force Belle to make decisions about the future of her country that she is ill equipped to handle. She is a simple girl of her time with little education or understanding of political intrigue. And at times, she has a sharp tongue. In one passage she remarks on, “ . . . the cloying stench of competitive piety,” when she enters Canterbury. Yet she wants to do the right thing; she’s enthusiastic and her heart is always in the right place. Belle is also fiercely loyal to those she cares about, and at one point, speaks out during a trial to save Walter’s reputation, an action that could guarantee Luke will be lost to her forever. 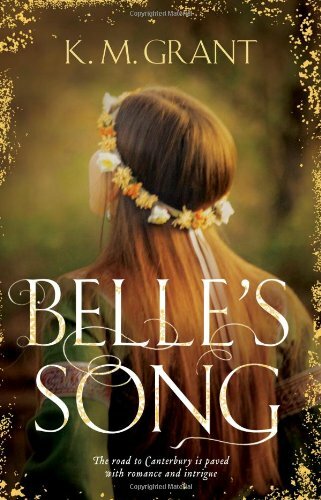 Belle’s Song is an excellent introduction to Chaucer and his Canterbury Tales. Many of us are unlikely to turn to the original version written in its mutable Middle English, but this lively novel is likely to draw in a new group of readers who may be unfamiliar with Chaucer. Belle’s Song stands out among today’s young adult novels of dystopian futures and paranormal love affairs as a shining example of the best in historical fiction.